Includes classic songs "Cotton Fields," "God Bless' The Child," "Hallelujah I Love Her So." Recorded in New York City in January and March 1958, and in Hollywood, California, in June 1958. As the liner notes by Nat Hentoff state, there is not much to say about the individual performances that is not entirely clear on hearing them. 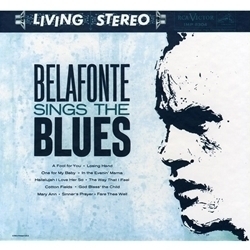 Truly a classic for discerning audiophiles, Belafonte Sings The Blues was the first Belafonte album recorded in stereo. The sound is incredible, and the dead-silent backgrounds of QRP 200-gram vinyl preserve every exquisite detail! This is one of Belafonte's most satisfying set of performances. "This is the area - the blues - with which I have the strongest identification," emphasizes Belafonte. It took a long time, however, before he was able to make this kind of a direct, basic blues album. By blues, incidentally, it is not meant that the songs are strict blues in terms of bar and chord structure, but that the feeling and the wryly unconquerable spirit of the blues pervade all the numbers. "When I started singing," Belafonte explains, "I was involved with an enbironment that emphasized the modern school of jazz, and it was difficult for me to adapt the way I felt to the requirements of that kind of singing. But that was what I was exposed to at the time. I've always had a feeling for the basic blues, but it took several years of removing myself from the predominantly modern jazz environment and finding myself and my own set of blues before I had teh courage to attempt an album like this. Here I can just step out and sing wholly the way I feel."